favourite narrow lanes of Vilnius Old Town. 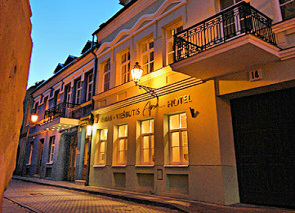 The hotel occupies an atmospheric 17th century building and is surrounded by quaint churches, which gives you a taste of medieval spirit. 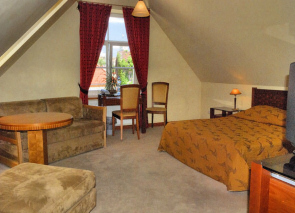 Having only 9 rooms and 3 suites Apia hotel would be ideal for those seeking a more intimate, private house atmosphere. The hotel is pretty good value considering its location and pleasant ambiance. Apia stands just slightly off the road from the main streets of the Old Town. 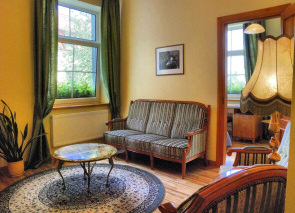 It is very close to Vilnius University and also Vilnius Cathedral and some other attractions are within 5-10 minutes walking distance. 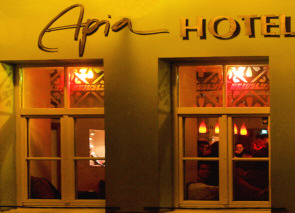 Apia hotel is also known for its genuinely hospitable and helpful staff, who pay attention to your individual needs and make the stay even more comfortable. Apia is a popular choice with people travelling with children. Services include dry cleaning / laundry, free parking is available. In addition the hotel offers some extras including fax machines, car rental and you can also book tours with them. Breakfast served to your room at the time you choose is a nice touch. Breakfast and all taxes are included when you book the hotel. The funky bar Briusly is attached to the hotel and is popular with the locals and tourists. Note that there are a few facilities lacking like mini bars and in-room safes. Children from 6 to 12 years old get 50 % discount. If you wish to read other people’s reviews who stayed at the Apia Hotel, check out room rates and available booking dates, click on the link below.